Etta and Abby may look familiar to you because they are (and were–Abby is no longer with us) part of Joan Osofsky’s family and could often be found at the wonderful Hammertown Barn in Pine Plains, NY. When I displayed it in a show at Hammertown Rhinebeck last year, Joan asked me to make a large print on canvas in sepia tone, which she displays at the Barn. I recently made a set of color metallic prints to show at vets’ offices. There is no glass over these prints and they have a kind of inner glow that I love. I so love that there are no reflections when you view these. There is an immediacy that really makes you feel like you’re right out there in the field with the pups. 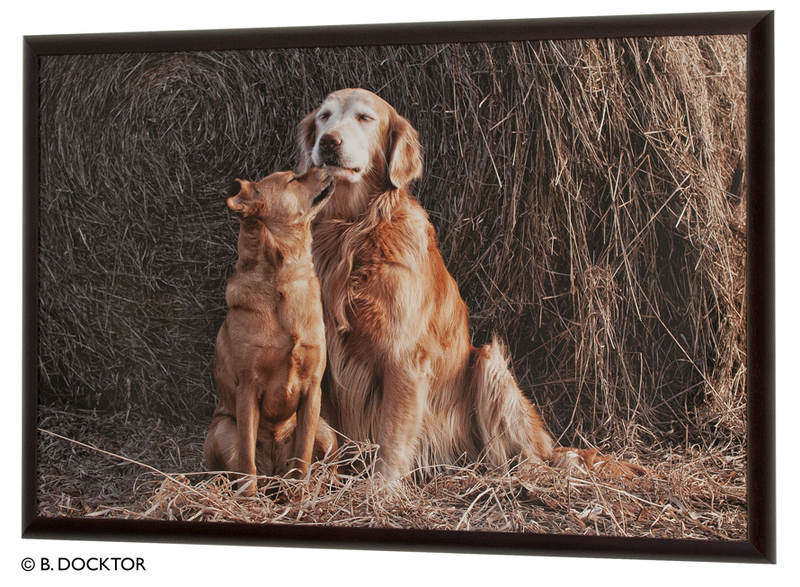 It’s time to start making award-winning photographs of your pets and animals! Hudson Valley pet photographer B. Docktor specializes in conveying the character, beauty, and humor of your pets. Call B at 518-329-6239.